Donald A. Mackenzie was a prolific writer on religion, mythology, and anthropology in the early 20th century. One of his many works was Myths of Pre-Columbian America, published in 1924. Chapter 15 of that book is entitled “White Missionaries and White Gods”. You can read it here at Google Books, but since it was published after 1922, you can only read parts of it. 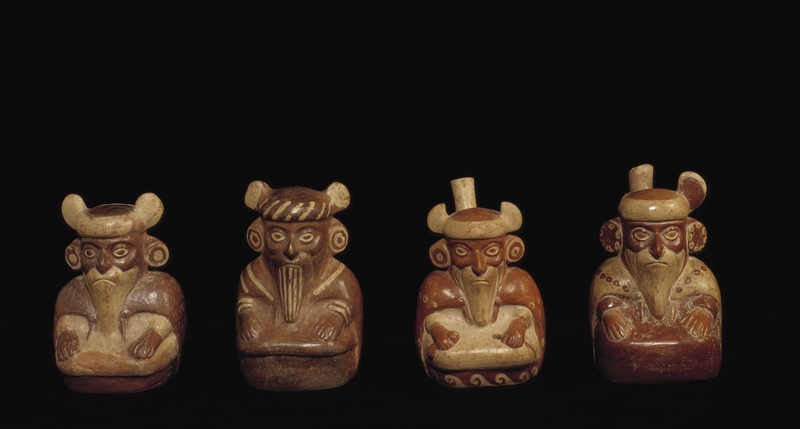 The ceramic vessels in the photograph below were produced by the Moche culture, which flourished from 100 to 800 AD. They all have beards, and their facial features are obviously Caucasoid. And again, they’re all wearing long robes. Where did the White Gods come from? Below is the Genographic Project 2.0 map of the distribution of I-M26. It’s strange that it shows Sardinia as having almost no I-M26, because every other source says that Sardinia has the highest frequency of I-M26. 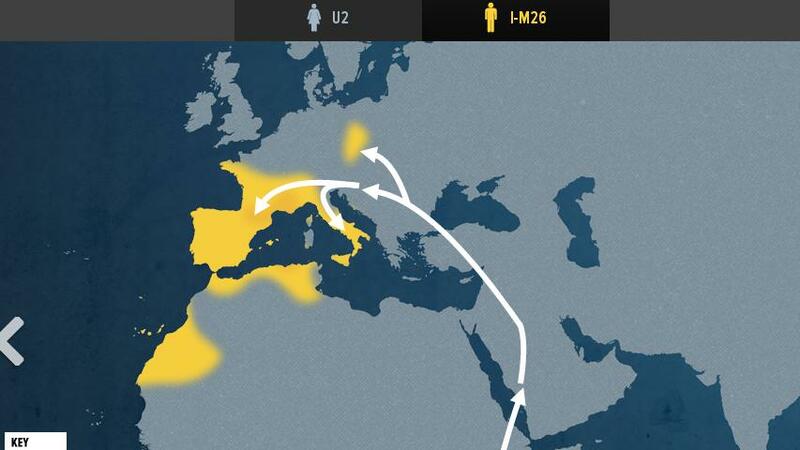 They might have found a Sardinia-specific subclade of I-M26 and put it on a different map. The lines and arrows showing I coming out of Africa and Arabia are preposterous. (I wonder if Spencer Wells is still saying that R1b is Cro-Magnon?) But every other part of the map agrees with everything I’ve read about I-M26. I think that the place on the map that the White Gods came from was the Canary Islands or Northwest Africa. 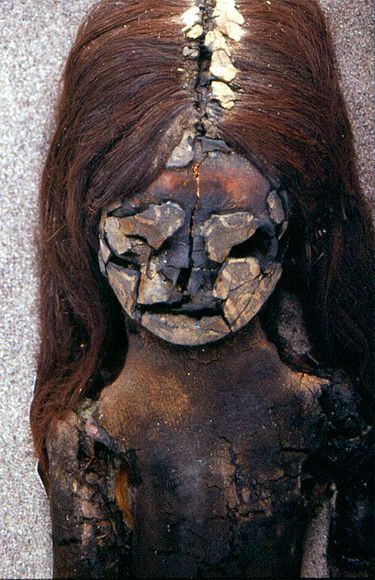 The Paracas and Nazca mummies had red and blond hair, and the original inhabitants of the Canary Islands, the Guanches, also had red and blond hair. When Columbus first sailed in 1492, after leaving Spain he followed the Canary Current to the Canary Islands, and stopped there to restock provisions and make repairs before sailing west to the Bahamas. When did the White Gods come to the Americas? 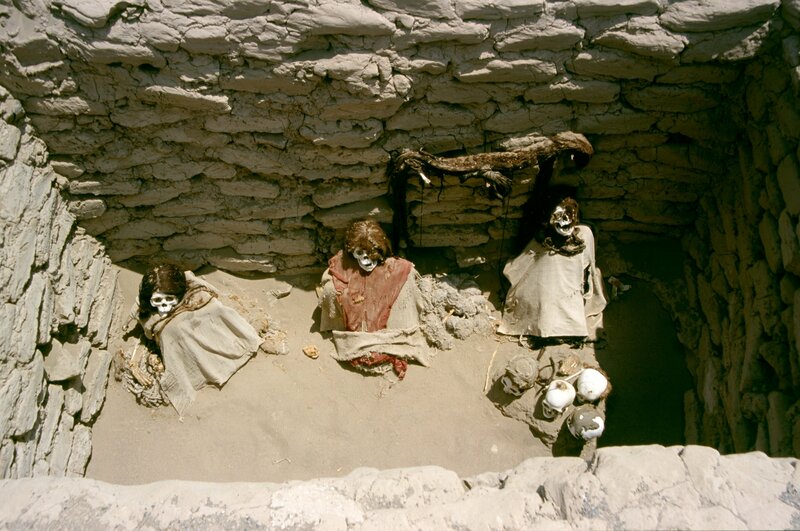 The first civilization in the Americas was the Norte Chico civilization in Peru. It flourished between the 30th century BC and the 18th century BC, but the city of Huaricanga existed around 3500 BC, and some communal architecture has been dated to 3700 BC. Andean civilization therefore antedates Egyptian civilization. The largest city of the Norte Chico civilization was Caral, which was inhabited between 2600 and 2000 BC. Below is a photograph of some of the step pyramids at Caral. 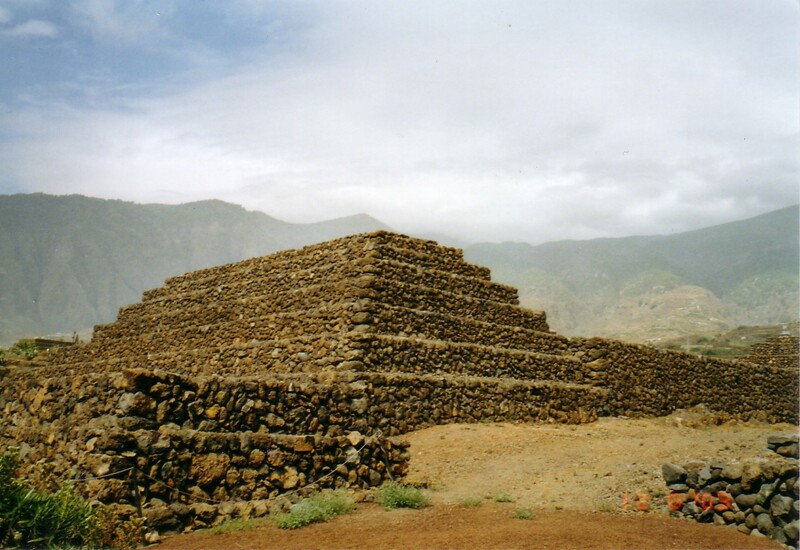 There’s another place that has step pyramids like the ones at Caral: the Canary Islands. 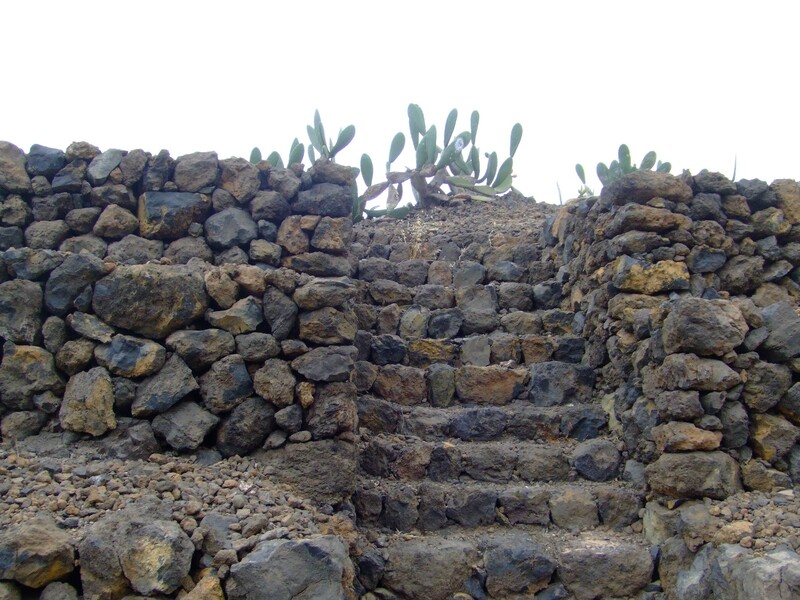 Below is a photograph of one of the pyramids at Güímar, on the eastern side of Tenerife. 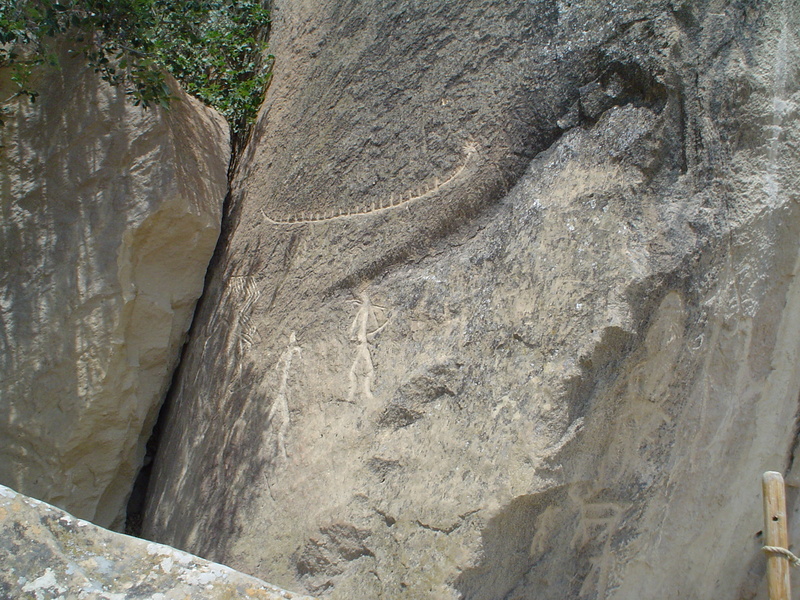 And below is a photograph of a stairway built into one of the sides of a Güímar pyramid, just like the Caral pyramids. 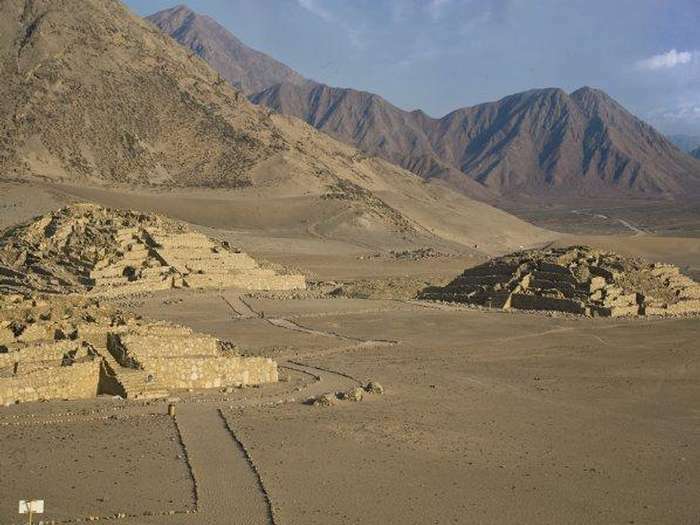 Of all of the many step pyramids of the Americas, the ones that most closely resemble the Canary Island pyramids are the very earliest ones, the ones at Caral. 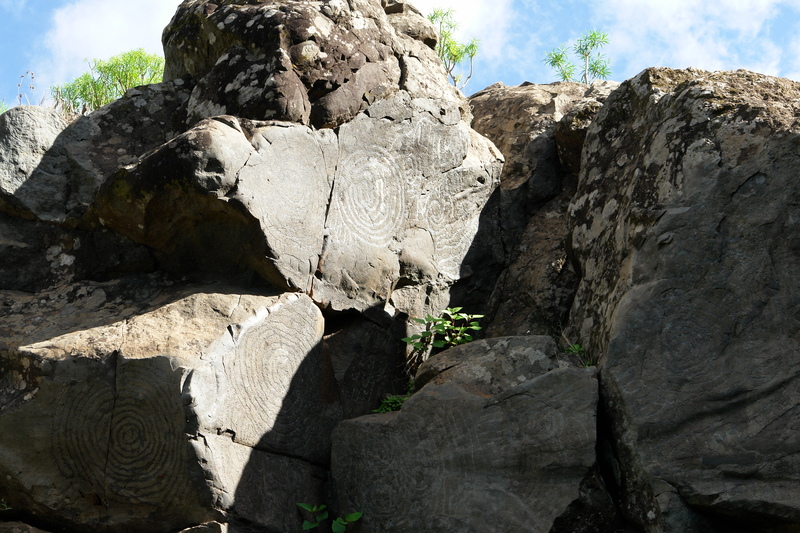 The existence of the Güímar pyramids was unknown outside of the Canary Islands until 1990. In that year Thor Heyerdahl read an article about them from a Tenerife newspaper. The connection of the pyramids to his earlier hypotheses must have been immediately obvious to him, and he ended up moving to Tenerife and spending the rest of his life there. There were plans for development of the land on which the pyramids stood, and to prevent their destruction, Heyerdahl persuaded his friend and businessman Fred Olsen to buy the site. 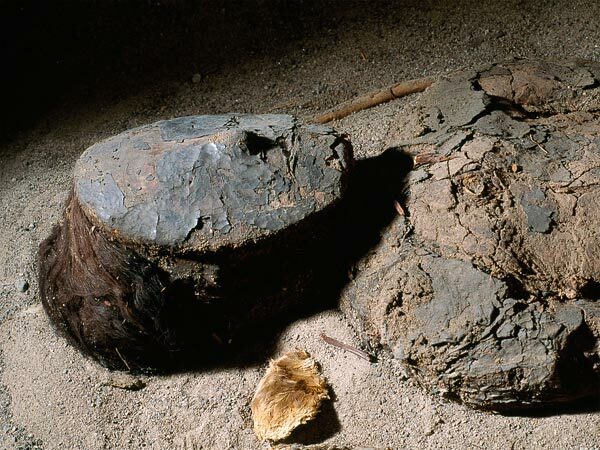 Between 1991 and 1998, with Heyerdahl’s agreement, excavations of the site were performed by archaeologists from the Canary Islands’ oldest and largest university. Sites on Internet about the Canary Island pyramids can divided into two categories: mainstream and alternative. The mainstream sites state as indisputable scientific fact that the pyramids are not ancient. Upon their discovery, the mainstream position was that the pyramids were just random piles of rubble from farmers clearing their land. Anybody who’s seen the pyramids knows that that’s pure nonsense. Then the story became that the pyramids were actually agricultural terraces. The “scientific” excavations that were performed concluded that the pyramids could not have possibly been built any earlier than the 19th century. All of the mainstream sites repeat this “fact”. Anybody who’s seen the pyramids can see that they couldn’t possibly have served any kind of agricultural purpose. Where else on earth did 19th century farmers take time off from their farming to build massive stone structures? Nowhere. And they didn’t on the Canary Islands, either. Pliny the Elder wrote that the king of Mauretania, Juba II, sent an expedition to the Canary Islands around 50 BC. They found that the islands were uninhabited, but that ruins of great buildings were there. If it wasn’t the pyramids that they saw, what did they see? Were they hallucinating? But these kinds of pyramids aren’t found just at Caral and on the Canary Islands. They’re also found on Sicily and in Libya. Here is the european-pyramids.eu page for the Sicily pyramids. Note that I-M26 is also found in Sicily and in North Africa. 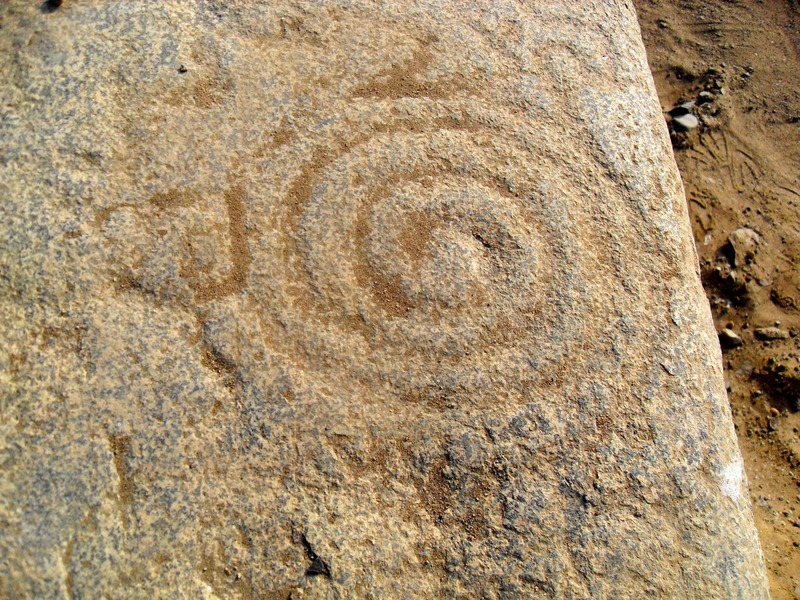 Below is a photograph of a petroglyph found on one of the Caral pyramids. 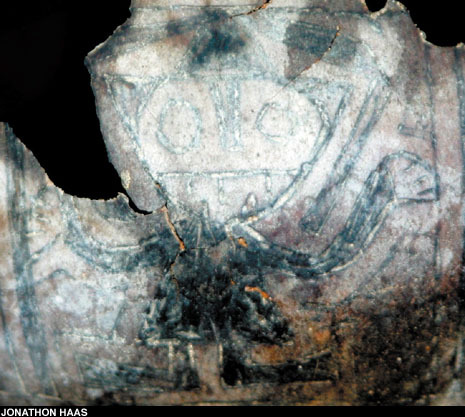 The oldest known image of a god ever found in the Americas was on some broken gourd fragments from the area of the Norte Chico civilization, and it dates to 2250 BC. A photograph and a drawing are below. 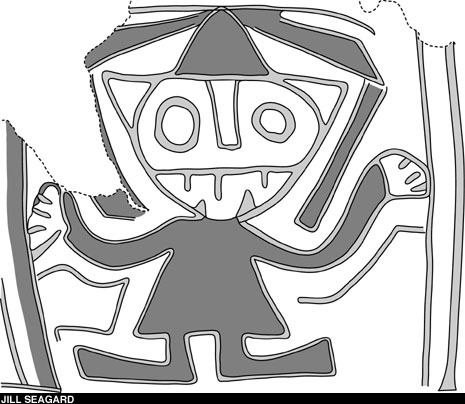 Other depictions of this god have been found, and archaeologists refer to it as the Staff God. 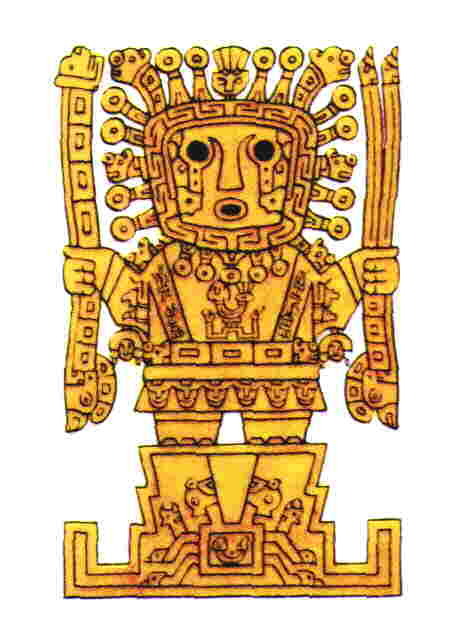 It’s obvious that the Staff God and Kon-Tiki Viracocha are one in the same deity. The Andeans were worshiping the same god for at least 4000 years. 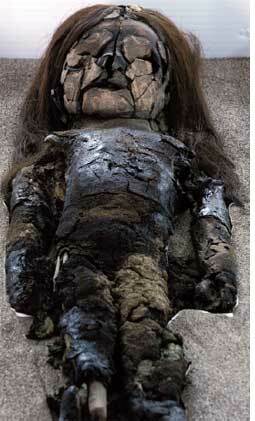 The oldest mummies in the world are the Chinchorro mummies from northern Chile and southern Peru. 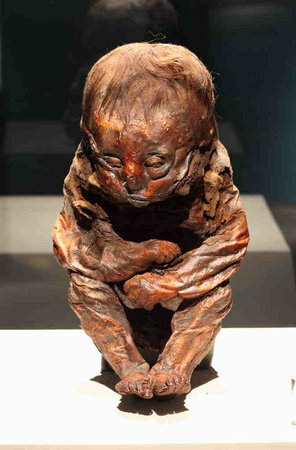 While the earliest Egyptian artificial mummy dates to around 3000 BC, the earliest Chinchorro artificial mummy dates to around 5050 BC. 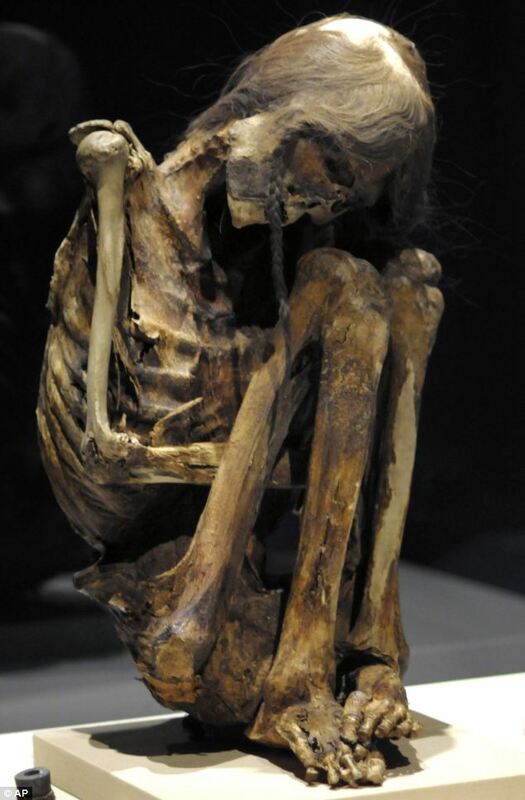 And while the earliest Egyptian natural mummy dates to around 3400 BC, the earliest Chinchorro natural mummy dates to around 7020 BC. 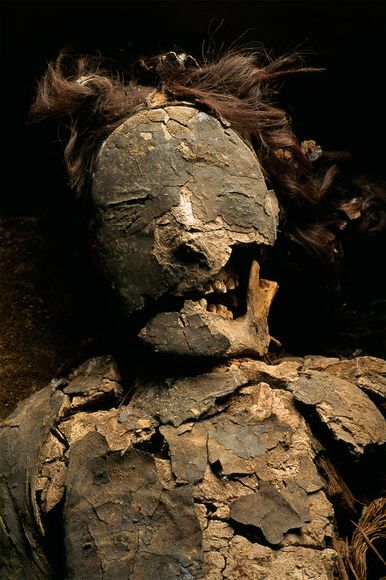 Here is a photograph from New Scientist magazine of a 3410-year-old mummy from northern Chile. She has brown Caucasoid hair, white Caucasoid skin, and tattoos on her white Caucasoid breasts. The caption for the photograph says that she has “long black hair”. The people at New Scientist magazine must think that their readers are either blind or stupid. 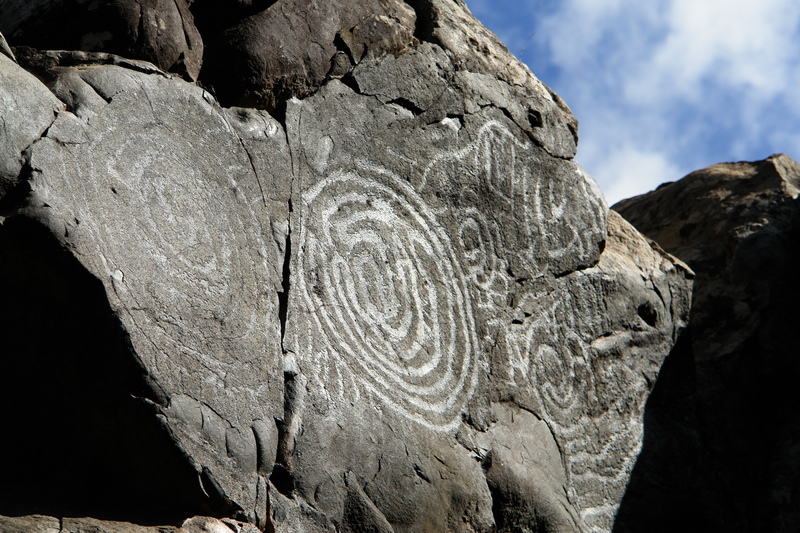 The world’s oldest known tattoos are from the Chinchorro culture, and date to 6000 BC. 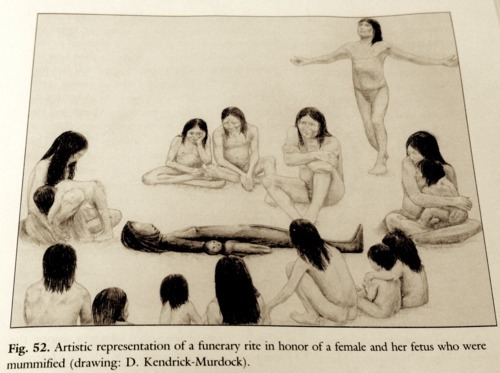 I came across the illustration below of a Chinchorro funerary rite. Of course the people are depicted as being Mongoloid Amerinds. It’s a disgusting attempt at rewriting history. 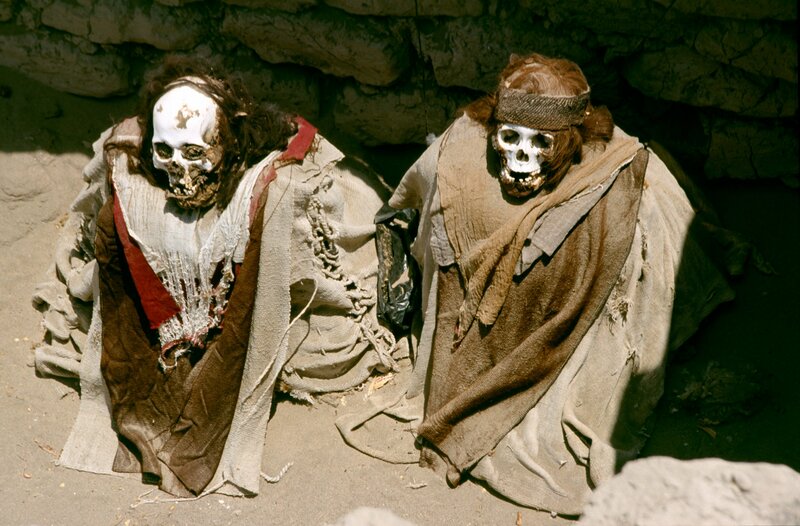 The Chinchorro culture was the only Andean culture that performed mummification on all members of their society. 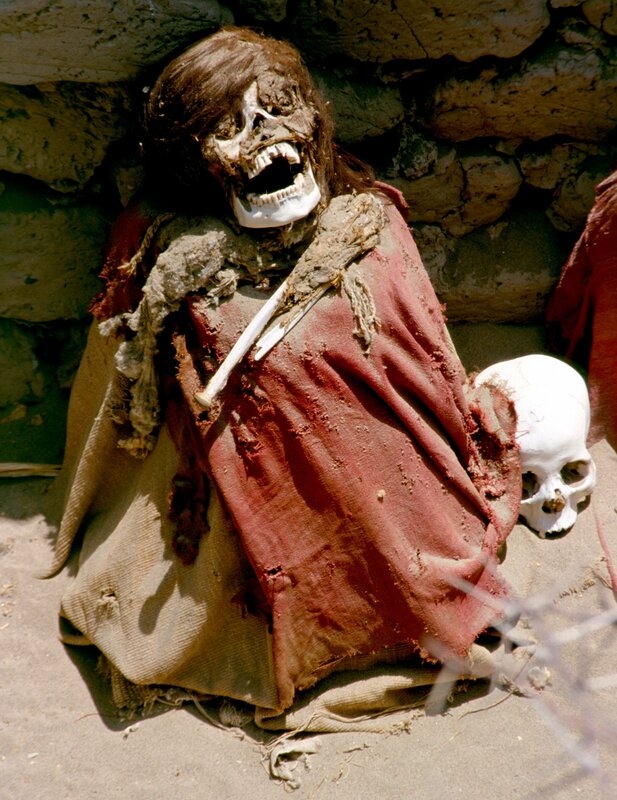 In all of the other Andean cultures, only the elite were mummified. This may mean that only the Chinchorro culture consisted exclusively of Caucasoids, and that all of the other Andean cultures were comprised of a Caucasoid elite ruling over a Mongoloid proletariat. 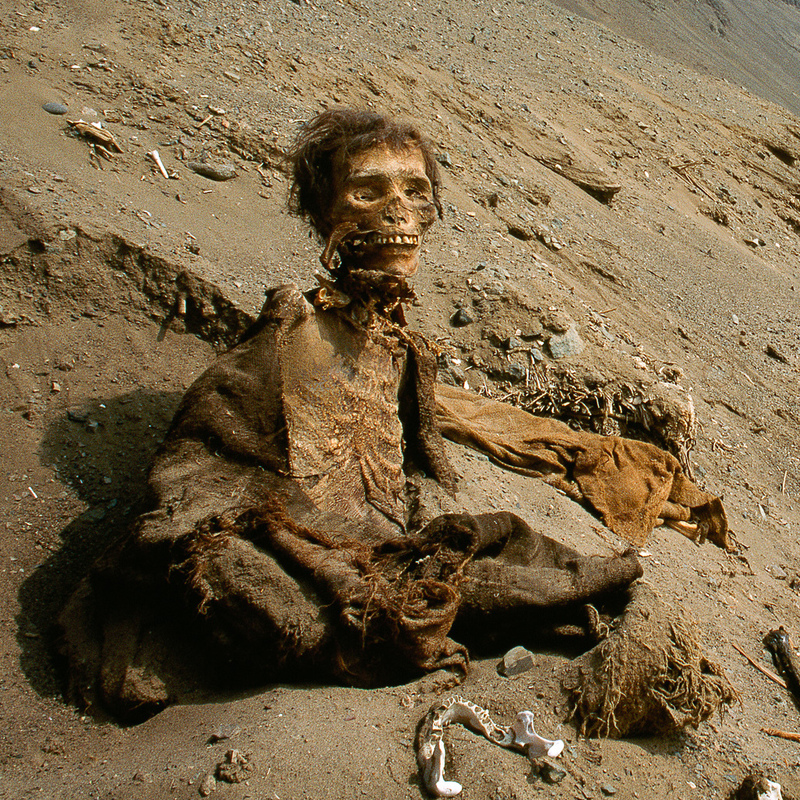 The Wikipedia Mummy article mentions only three ancient peoples as having practiced artificial mummification: the Andeans, the Egyptians, and the Guanches. I believe that all three were connected. 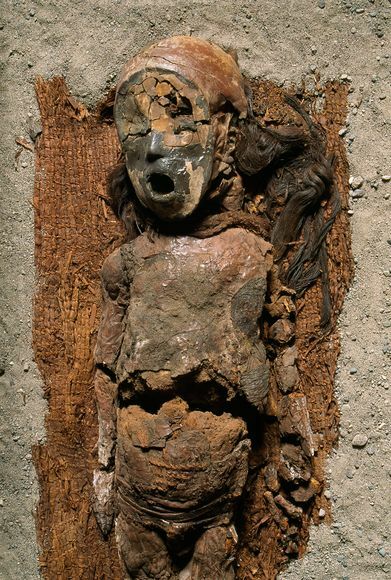 One of the oldest of the natural Egyptian mummies from 3400 BC was nicknamed “Ginger”, because it had red hair—just like the Andeans and the Guanches. In 1970 Heyerdahl crossed the Atlantic in Ra II, a reed boat made by boat builders from Lake Titicaca. The oldest known remains of a reed boat are from Kuwait, and they were dated to 5511–5324 BC. 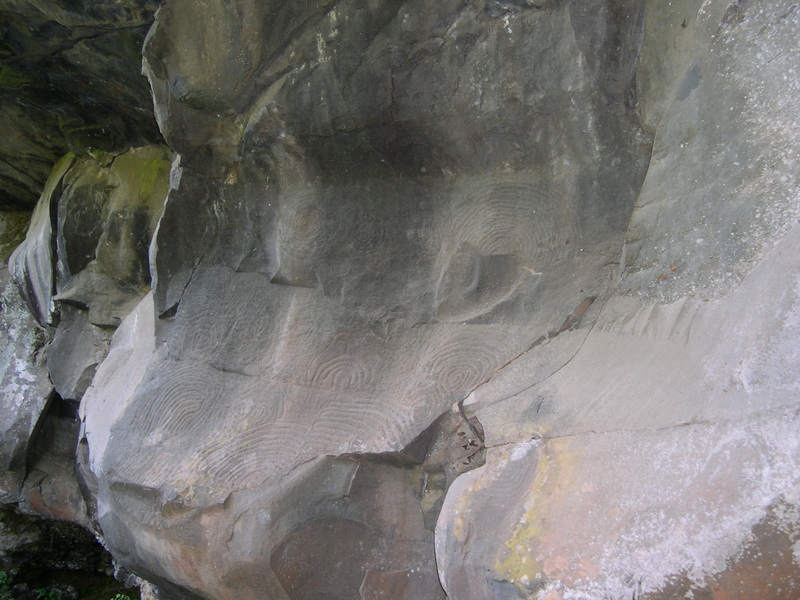 But the petroglyphs depicting reed boats at Gobustan, Azerbaijan, like the one below, date back to 10,000 BC. 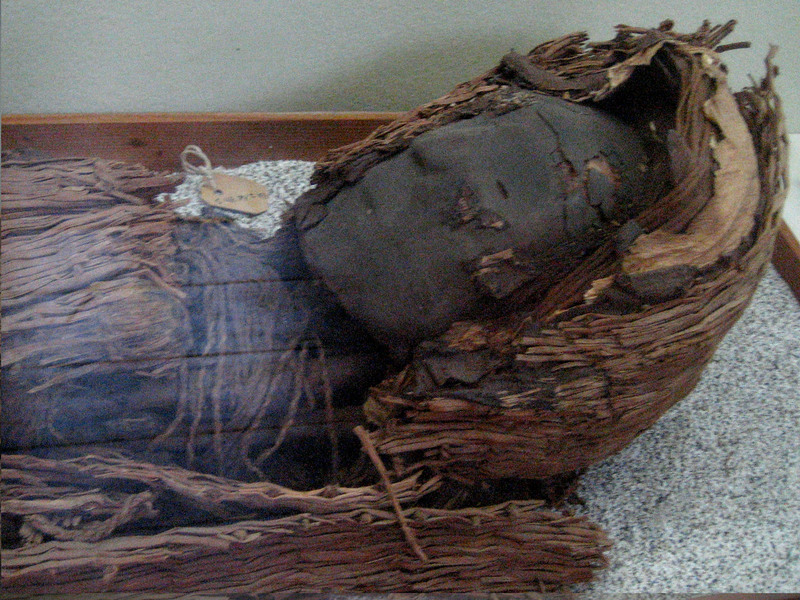 Since the White Gods came to the Americas in reed boats, it’s interesting that many of the Chinchorro mummies were wrapped in reeds, as shown in the photograph below. Eupedia.com says that I-M26 is 8000 years old, and one of Ken Nordtvedt’s documents gives the TMRCA for I-M26 as 6000 years, but I’m certain those are wrong. 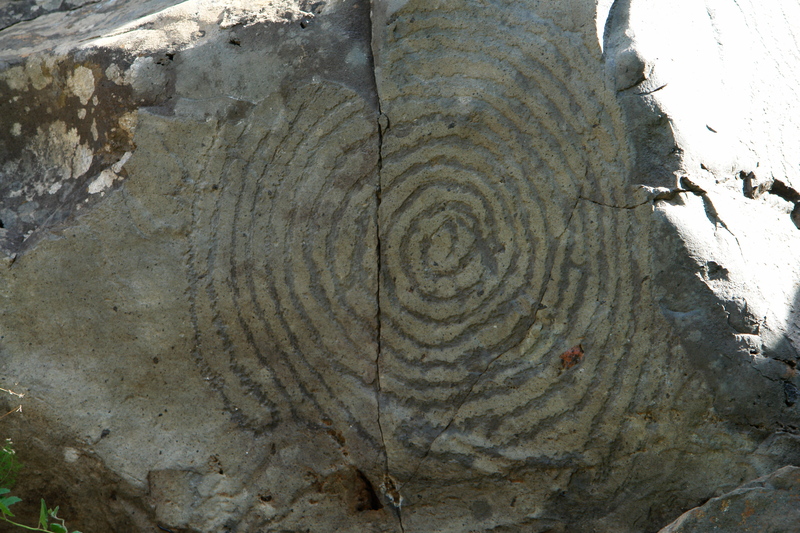 A 2008 paper estimated that the TMRCA was 21,000 years and that the population began to expand 14,000 years ago. In this message from 2009, Nordtvedt says that “The biggest impression is that M26+ I2a1 is remaining incredibly old as measured by variance”, and that “I have to conclude M26+ I2a1 is involved in the early post-LGM repopulation of extreme western Europe”. 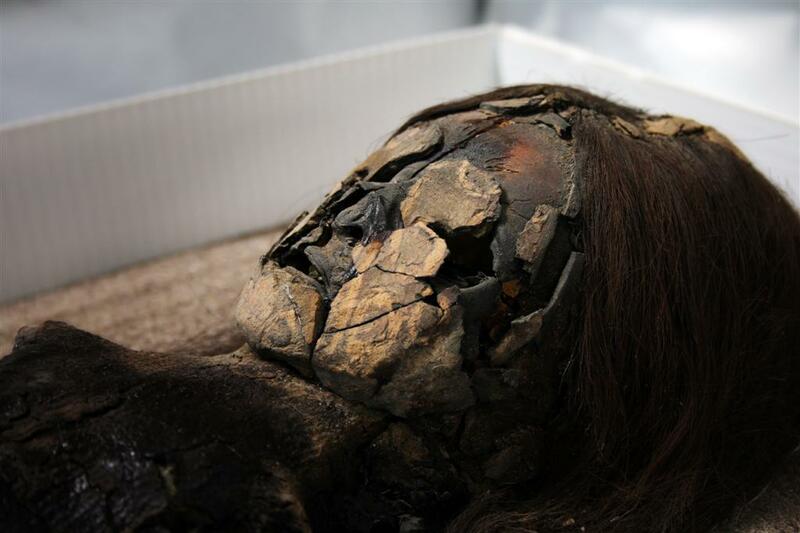 And in this post from last year, Dienekes used 1000 Genomes data to estimate that the split between I2a1a-M26 and I2a1b-S328 happened 23,000 years ago. 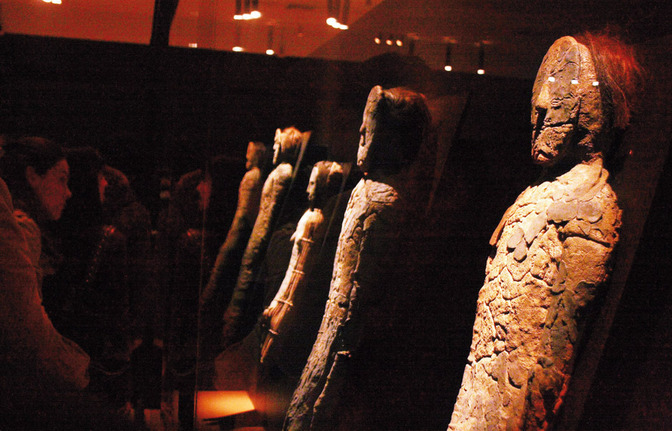 So, to answer the question that began all of this, I think that the White Gods started coming to the Americas from the Canary Islands or Northwest Africa in reed boats sometime between the end of the LGM and the early Holocene. When Heyerdahl crossed the Atlantic in Ra II, he made landfall in Barbados. We can imagine that the White Gods arrived somewhere around the same area, and continued to the northern coast of South America. They then would have followed the coast west until they reached the Isthmus of Panama. At that point they went south and populated the coasts of what are today Ecuador, Peru, and Chile. 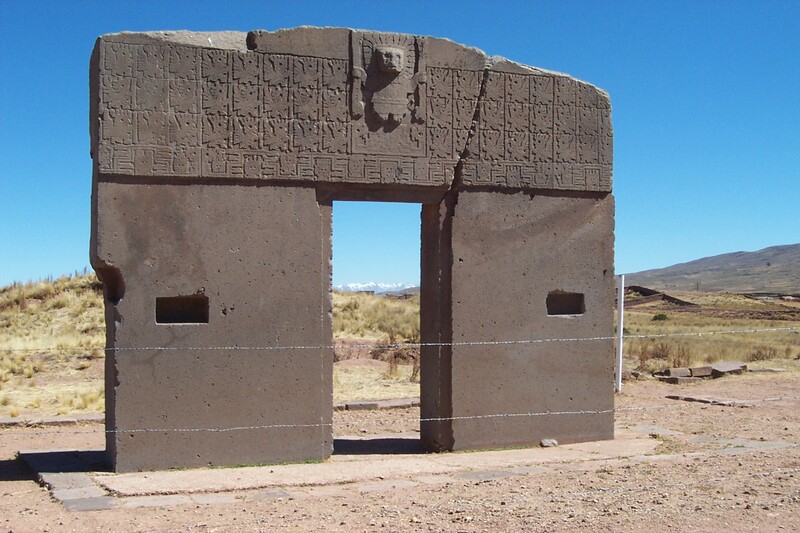 There they would build the great Andean civilizations, starting with the Norte Chico civilization. In time some of them would journey north and initiate the Mesoamerican civilizations. And at some point, some of the White Gods traveled across the Pacific Ocean, to the islands of Polynesia.